Objectives of the Trail Riders are to “encourage travel on horseback through the Canadian Rockies, to foster the maintenance and improvement of old trails and the building of new ones; to encourage the love of outdoor life, to study and engage in the conservation of birds, wildlife and alpine growth, to assist in every possible way to ensure the complete preservation of the National Parks of Canada for the use and enjoyment of the public.” Environmental awareness has always been a top priority of the TRCR, and we have been a leader in reducing backcountry impact. After an exhilarating day on the trail our guests return to our base camp where they are served hot home cooked meals, followed by campfire entertainment, educational talks, and music, before retiring in their own sleeping bags (on raised cots with mattresses) in canvas tents. The camp is complete with hot water for washing/showers, and dry toilets. Each day will find the riders exploring lakes, valleys, glaciers or mountain passes. The high, uninhabited valleys of the Rockies offer peace and contentment combined with the thrill of majestic visas. There is a sweep of majesty to this land, a towering grandeur and nobility of face, so powerful in its vast silence. This alpine land abounds in larch, spruce and fir trees, mountain animals and birds, meadows and parklands leading to the nearby snow capped peaks and ridges. Riders come from around the world and you will meet people from all walks of life who share your joy of the wilderness. 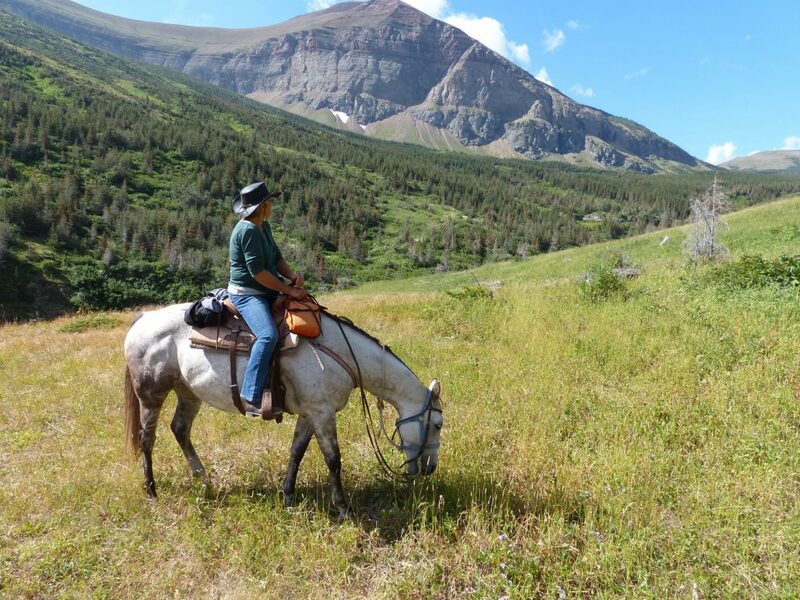 We supply all horses, western tack, great meals, and accommodation. Families with young people are welcome to attend the rides with one or more of their parents (or grandparents – a frequent occurrence). An adult must accompany all riders under of the age of 18. Children be at least 9 years old and have some camping/horse experience. Riding experience of the member’s ranges from very little to years in the saddle. Dudes, absolute tenderfeet, who wouldn’t know which end the bridle goes on, are welcome to swing into the saddle and take to the high trails with the more experienced riders and guides. The riders travel by bus to the trailhead corral where they are met by cowboys and horses. Here the dudes are matched with a horse according to the information given on their application form. Each horse is a sure-footed, well broken animal, accustomed to the sometimes-rocky terrain and tolerant of the greenest tenderfoot. The history of the trail riders dates to 1923 when a group of 14 avid riders, who were camping and fishing along the Kootenay River, got together around a campfire and discussed the potential for a riding club. We haven’t missed a year since! Today, people from all over the world join the Trail Riders each summer. Many people come back year after year to renew acquaintances and make new friends. In fact, we boast a higher than normal guest return rate with some riders having been on 30 or more rides!